Are you looking for tips on staying organized or wanting a new option for storage? Find out about California Closets and how the company can design a custom storage solution for your home in this exclusive interview with Chief Organization Officer and Vice President of Sales and Marketing, Ginny Snook Scott. LoveToKnow (LTK): Can you tell us about California Closets and your role with the company? 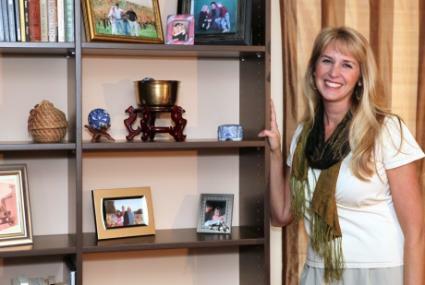 Ginny Snook Scott (GSS): California Closets is a home storage solutions company that creates custom products and services for those looking to get and stay organized. We are in business of trying to simplify people's lives. I've been with the company for over 25 years and have helped more than one thousand clients globally organize their home. My role is to help educate our franchisees, their staff and our customers on the best ways to creatively store, organize and display their personal belongings. LTK: What are your favorite organization trends? GSS: My favorite trend is that closets are becoming multifunctional. Closets are where people start and end their day, so they are becoming places of retreat. People are incorporating coffee makers, wine coolers, flat screen TVs, and even workout equipment to create this escape from everyday life. Additionally, drawer organizers are getting very popular - specifically, we design "out of pockets" drawers. These are usually the top drawer, of which people can empty their pockets out into. They can hold everything from keys to receipts to loose change. This drawer is also adapting with technology and can be outfitted with a charging pad for smart phones and other mobile devices. LTK: What are some spaces that can benefit from custom storage solutions? GSS: Any space in the home can benefit from custom storage solutions. Of course closets are the most popular, but we also organize mudrooms, kitchens, craft rooms, garages and entertainment centers. LTK: Can you tell us about some of the biggest challenges that people face when trying to organize their space? GSS: It is extremely common that people try to put too much in too small of a space. People also tend to store items in spaces that don't fit them. Storing things out of sight keeps them out of mind. Using drawers for sweaters and t-shirts keeps them hidden from you. These items should be stacked up in short piles where you can see them. LTK: Is California Closets just a luxury or can the average homeowner afford to use them as well? GSS: California Closets makes customization affordable. The average job size is $3,500. There are many offerings that range from $500 to $1,000. LTK: Can you share some organization tips with our readers and how they can get started organizing their homes? Motivating music: Cleaning and organizing always seems more fun if you're energized by your favorite songs on your iPod. Rotate décor: This is the best way to change the look and feel of a room without spending a dime. By rotating your décor, you're able to de-clutter and enjoy seeing "new" things every few months. Deep clean your cabinets: The kitchen is the heart of most homes. Clutter tends to collect in cabinets and drawers. Take a weekend day and empty each cabinet. Hold yourself to the two year rule, donating whatever you haven't used in the last two years to charity. Purge the personal stuff: Purge your wardrobe of the things that you no longer love or wear, and make room for something that expresses the current you. Divide and conquer: Since we all have those kitchen, desk and bathroom drawers that drive you crazy with clutter, take an afternoon to insert drawer dividers into each troubled drawer. A (little) arm's distance: In kid's rooms, make sure shelving is no more than 10 inches tall to prevent stacks of clothing that are too high and can topple over when little arms are trying to pull something out. Organize visually: You always want to think about what you are trying to accomplish in your design scheme visually. If it's a teacup collection, for example, you could design the teacups by color scheme or by size - or maybe create depth by alternating with small and large cups. LTK: What are some of the latest products from California Closets? GSS: Ecoresin inserts are a part of the California Closets Accents collection. The Ecoresin elements are handmade sheets of resin with natural materials, like bamboo rings and leaves, compressed between them. Ecoresin has several benefits and features and are a fun, natural way to decorate. We are also looking at expanding our core product offering with textured laminates in various finishes and wood grains. We're working on new hardware for door and drawer pulls and new insert materials for doors and drawers, which are all always exciting for our customers. LTK: Does California Closets have store locations? GSS: We have franchisees in the U.S., Canada, the Caribbean and Mexico. California Closets is the largest custom storage franchise-based company in the world. The company is known for intuitive organization, innovative design, and a commitment to creating an exemplary customer experience. The headquarters is based out of Berkeley, CA. LTK: How can someone contact California Closets? GSS: Information can be found on our website, at our showrooms or by calling us at 888-336-9707. LTK: Is there anything else that you would like to add? GSS: One of the most important tips I can provide is to encourage readers to develop and establish good organization habits early. Make things routine and habitual. By establishing places for your stuff early on, you're more inclined to keep things organized. The same can go for kids or pets - establish a spot for kids to store toys or pets to sleep. Once you have the right habits in place, organization is not that much work. If you are short on space and need to get rid of clutter, consider a custom storage solution such as one designed by California Closets. Whether it is an overflowing closet or just wasted space, there are solutions that can turn it into something you will enjoy storing your items in. From clothing to crafts, storage spaces can be designed to meet your needs and house your items in an organized manner that you will be proud of showing off.